22 expert judges have gathered for the 16th annual Australian Grand Dairy Awards with Le Cordon Bleu Sydney Head Chef Andre Sandison one of the esteemed judges. 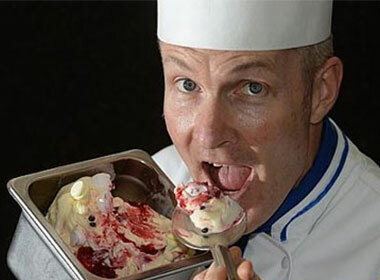 With his educated palate our Chef Sandison will be taste testing over 250 ice creams in the running for the Dairy Australia Ice Cream Award with winners to be shortly announced. Run by Dairy Australia these awards began in 1999 to recognise and reward excellence and innovation in Australian dairy produce and to acknowledge the achievements of the highly skilled, pioneering people who produce those products. As part of the Australian Grand Dairy Awards program, Dairy Australia recognises and awards the ‘best of the best’ cheese and dairy produce in the country, sponsors and supports the state qualifying competitions and manages comprehensive cheese and dairy judge-training around Australia. Now in its 16th year, the Australian Grand Dairy Awards aim to increase promotional activities surrounding the winning products and to raise awareness of the quality and versatility of Australian dairy products. To see the full list of this year’s winners, please visit the Legen Dairy website .